Tánaiste Simon Coveney confirmed today that a number of Cork schools will benefit from Department of Education grants to post-primary schools to support the rollout of new Leaving Certificate subjects this September. Computer Science and Physical Education will on the curriculum for the Leaving Certificate for the first time to ensure that our education system keeps pace with our changing society and the evolving needs of our economy. Cork South Central TD and Minister for Foreign Affairs Simon Coveney said: “I am delighted that a number of Cork schools will be rolling out of new Leaving Cert subjects. Glanmire Community School, Kinsale Community School, Christian Brothers College in Cork city, Colaiste Choilm Ballincollig and Beara Community School and Maria Immaculata Community College in West Cork are among those to receive funding in this phase 1 rollout of PE. 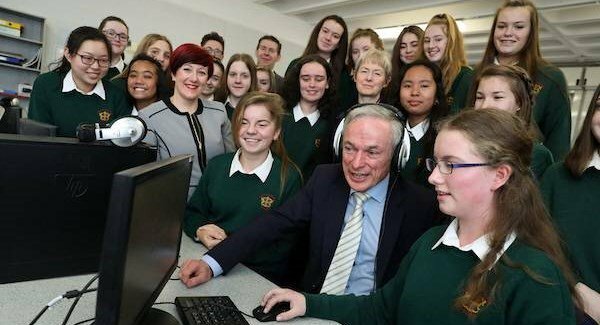 Six Cork schools will receive funding to support the teaching of Computer Science as a Leaving Cert subject including the purchase of digital connector devices. “The introduction of Computer Science as a Leaving Certificate subject is part of our ambition to make Ireland a STEM (Science, technology, engineering, and mathematics) leader among our European colleagues. The Cork schools to receive grant support are Carrigaline Community School, Christ the King Girls Secondary School in Douglas, Coláiste an Chraobhain in Fermoy, Coláiste Choilm in Ballincollig, Mayfield Community School and Sacred Heart Secondary School in Clonakilty. “The grants being issued to schools, from this September will complement other recent grants given to schools to support them in embedding digital technology in teaching and learning – €30million in ICT grants was provided to all schools recently, building on the €30m which we issued last year. We have committed to a €150million investment in ICT infrastructure over the next 3 years,” the Fine Gael Minister said. The specification for Leaving Certificate Physical Education (LCPE) will provide learners with an opportunity to study physical education for the Leaving Certificate examination, providing an additional optional Leaving Certificate subject. The specification is presented in two strands. The 64 schools announced previously will begin studying the examinable subject from this September. 80 schools in total will implement either the examinable Physical Education Leaving Certificate subject or the new Senior Cycle Physical Education Framework which is not for examination, or both. The specification for Leaving Certificate Computer Science (LCCS) for Leaving Certificate focuses on how programming and computational thinking can be applied to the solution of problems, and how computing technology impacts the world around us. the ethical, historical, environmental and technological aspects of Computer Science, and how it impacts the social and economic development of society. The 40 schools announced previously will begin studying the subject from this September. The €3,000 grant per school will be towards the purchase of digital connector devices.